Is it possible to teach a pilot to fly without putting him in the cockpit even once? The Russian Air Force would say it is. The modern simulators used for practice make it possible to considerably speed up pilot training and to create training situations for experienced pilots in which the aircraft operate at the peak of their technical capability. The quiet merchant town of Torzhok in the Tver Region is known not only for its ancient history but also for being home to one of Russia's best military helicopter training schools, the Center for Pilots' Military Retraining. In Torzhok, helicopter squadron pilots with combat experience gained in Tajikistan, Chechnya, Sudan, Chad and Sierra Leone teach their trainees not only how to fly helicopters in extreme conditions but also how to use them in combat. 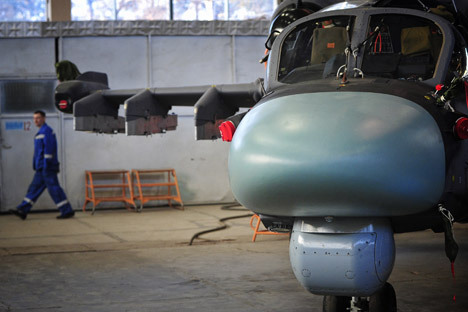 The center currently trains pilots for the Mi-28N Night Hunter and the Ka-52 Alligator helicopters. A Mi-28 is flying at maximum speed, following a meandering river. Judging by the instrument panel, we are at a height of just three meters and although the cockpit, where we are sitting with military pilot Rustam Maidanov, is just a simulator and the flight is a virtual one, now and then my head begins to spin because of the turns the helicopter is taking. It feels totally real. Having negotiated yet another cliff, we suddenly see a bridge in front of us. The pilot pulls the control slightly towards himself and the helicopter easily avoids the obstacle by quickly climbing several dozen meters up. He releases the control and we plunge down, back to the water. Russian combat aircraft simulators made by the Tranzas and Dinamika companies have been supplied to Venezuela (simulators for the Mi-171, Mi-17V-5, Mi-25 and Mi-35 helicopters), Nicaragua (the Mi-17V-5), the Czech Republic (the Mi-171 crew simulator), and Kazakhstan (the MiG-31). “Where are we flying?” I ask the pilot, trying to raise my voice above the roar of the engine. Naval aviation pilots for Russia's only aircraft carrier start their training not in the Arctic, where the Admiral Kuznetsov is based, but in central Moscow. The head of the mathematical and test bed simulation at the MiG aircraft corporation, Vladimir Ivanov, says that flight simulators is one of the most important areas of his company's work. A pilot training on a MiG-29 simulator is wearing 3D glasses, as if he were watching a sci-fi blockbuster at a modern multiplex. According to Ivanov, three-dimensional pictures help the pilot to get a better idea of the distance to different objects, their size and form. For instance, the training program envisages practicing a formation flight, in which the pilot needs to know the exact distance to the aircraft next to his, or mid-aid refueling from an Ilyushin Il-78 aerial tanker. To perform the latter in real life, a pilot needs to approach the tanker aircraft to a distance of 120 meters, gradually coming closer to it, since the refueling hose is only 21 meters (just over 22 yards) long. What follows next is a task of high precision: The receiver aircraft probe needs to couple with the drogue attached to the hose and receive fuel at a rate of two tons a minute. The distance between the two aircraft must remain the same and they need to keep up the same speed. Even on a simulator, this maneuver makes pilots sweat. However, landing on the Admiral Kuznetsov aircraft carrier is even harder. From a bird’s eye view, the massive ship looks no bigger than a matchbox. Flight simulation is not a new area for Russian aircraft manufacturers. However, it is only now, thanks to modern software, various hydraulic systems, and 3D visualization of the environment, that simulators have been capable to truly imitate a real flight and its conditions. The trainers in Torzhok say that having completed a training course on a simulator, for example of the multi-purpose Mi-8 helicopter, a second pilot can be put into a real helicopter straight away and entrusted with some simple flight tasks. Meanwhile, pilots of strike helicopters, like the Mi-28, Ka-28 and Mi-35, can use simulators to imitate, practically without limitations, real combat situations, which it is very difficult to do during peacetime exercises.